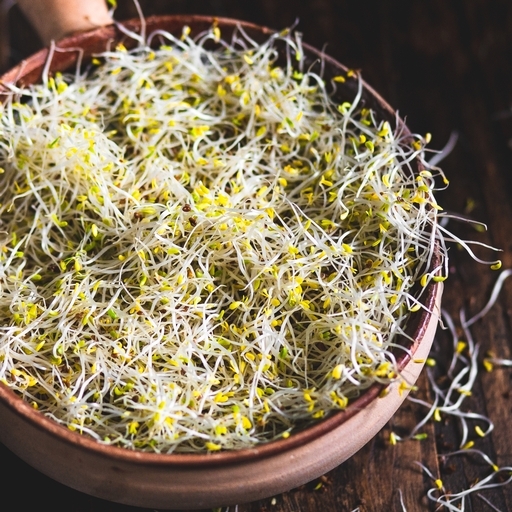 Fresh organic alfalfa sprouts. These healthy seeds add delicate texture and a mild, nutty sweetness to salads, sandwiches and stir fries. Get scattering! Sprouts will last for a few days in the fridge. Grown commercially, they are available all year round. SkySprouts was founded in 1984 by Brett and Kathy Kellett. Everyone thought they were having a hippie phase when they bought an acre of land and moved to Devon to grow organic veg, well before organic food became popular. Kathy read about the health benefits of beansprouts and started growing them on the kitchen windowsill in jars – and local people couldn’t get enough. Over 30 years later, Kathy’s daughters Ellisha and Kelda have taken over the business, still growing their flavoursome organic sprouts on the same farm in Devon.